The ATR-800 is a true international audio tape recorder in every sense of the word. 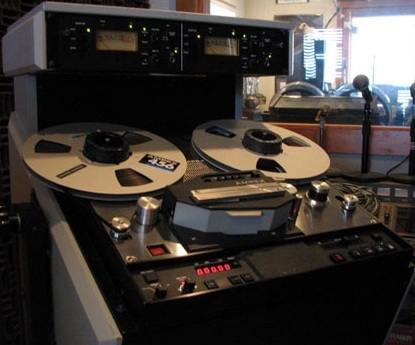 It provides both NAB and lEC recording standards with the performance, quality, and important features you've come to expect from Ampex. Ruggedly built, sophisticated yet easy to use, this newest member of the Ampex family of audio recorders is designed for the radio and television broadcaster as well as the recording studio owner who wants the most for his money. The ATR-800 is availabie in mono, stereo, 2, and 4 track versions and offers an impressive array of operation and editing features — many of which you'd expect to find only as options on other machines. Standard features include continuously variable shuttle, three speed and variable speed operation, built-in cue amplifier, single point search-to-cue and electronic tape timer. Numerous options and accessories further enhance the recorder's capabilities. Performance: Designed to meet international broadcasting and recording standards. Ensures that the recorded product has the highest, quality attainable. Designed for editing: All important edit modes are included; i.e., Dump Edit and Hands-on reel editing. The head assembly is wide open, making for unequaled accessibility to the heads for marking and cueing. Continuously Variable Shuttle: Provides continuous control of tape speed and direction when doing manual cueing. Speeds the manual cueing operation. Cue Amplifier: Allows monitoring of any or all channels of a tape at the machine during editing operations or while it is being cued. Recessed controls: All controls are recessed below tape level, preventing tape snag and speeding editing operations. Electronic Tape Timer: Provides accurate timing of recorded segments for all machine speeds in hours, minutes, and seconds. Left or right control panel mounting: Transport controls can be mounted to the left or right side of the machine to accommodate left or right handed operating and editing procedures. Switchable NAB and lEC machine setup: At the flip of a switch, the recorder converts between NAB and IEC setup. This includes bias as well as equalization. Three speed operation: All machines are shipped 7-1/2, 15, and 30 in./sec. and field convertible to 3-3/4, 7-1/2 and 15 in./sec. There is NAB and IEC setup for each of the three speeds. Fader start: Provides remote start and stop of a cued tape from the fader switch on the mixing console. Handles all standard reel configurations: Capacity for 10-1/2 inch NAB and the plastic EIA (Cine) reels is standard. Easily converts to 30 cm (11.8 in) DIN hubs with an accessory DIN hub kit. Universal power supply: Easily convertible to all world power standards. Stereo/Mono level switching: Maintains proper output level when playing mono tapes on stereo format machines. VU and Peak metering: Provides switch-selectable ANSI VU or EBU peak metering ballistics. Single Point Search-To-Cue: Provides automatic and quick return to a defined cue point. Uses the electronic tape timer for exceptional accuracy. Variable Speed Operation: Allows recording and playback up to ±10% of nominal speed. Corrects for recordings made off speed or allows for special effects. Quick change head assembly: Head assembly is quickly removed or installed by one quarter-turn fastener. The head assembly, when changed, requires no mechanical realignment. Speeds maintenance and format conversions. Microprocessor control: Transport is under the full control of the micro processor system, ensuring safe, gentle, and foolproof tape handling. Fully closed loop servoes: Closed loop servoes for the capstan and spooling motors provide exceptionally low wow and flutter and controlled tape tension in all transport modes. Closed loop servoes ensure proper tape handling for all reel configurations without reel size or type switching. Pick Up Record Capability (PURC): Compensates for the distance between the erase and record heads. Prevents gaps and overlap when recording over a previously recorded tape. Ceramic tape guides: Ceramic tape guides provide tape guiding that does not deteriorate with time. Precision alignment of the tape deck is maintained over years of usage. No fans: The recorder is cooled without the use of fans, providing low ambient noise and immunity from fan failure. No fan screens to clean. Phase Compensated Record Equalization: Ensures highest quality recorded audio through preservation of the audio waveform. Controllable for remote cueing and synchronizing: All necessary transport controls and signals are available through connectors, allowing remote cueing and synchronizing with other audio and video recorders. Serviceability: Major electronic assemblies are accessible from the front of the recorder in both the rack mount and console versions. These electronic assemblies are plug-in and serviceable on extender cards. Easy format conversion: Easily converts from one channel to two to four, or back. All machines are easily convertible to other formats in the field. Rack mountable: All ATR-800S are supplied with the necessary hardware to rack mount in a standard EIA 19 inch equipment rack. Standard mounting dimensions are used for adaptability to custom rack mount installations. FAST, EASY EDITING: The ATR-800 was designed for editing. It features an extra wide head assembly for easy access to the head area, recessed head gate and transport controls to prevent tape snag, and a continuously variable shuttfe. Hands-on-reel and tape dump modes have been incorporated into the transport design for convenient manual editing. Editing is further enhanced by an accurate electronic tape timer which provides timing of recorded segments for all speeds in hours, minutes, and seconds. In addition, a single point search-to-cue allows automatic return to a previously defined cue or edit point. Segments can be rehearsed over and over from exactly the same starting point at the touch of a single button. Unique to the ATR-800 are its interchangeable transport control panels. The panels can be mounted either to the left or right side of the machine to accommodate left or right-handed operating and editing procedures. QUICK CHANGE HEAD ASSEMBLY: With the ATR-8OO, Ampex introduces a new quick change head assembly. The unit is easily installed with one quarter-turn fastener. Once in place, no further mechanical realignment is needed. The high-precision record and reproduce heads are of metatlaminated construction to ensure extra long life and high performance. 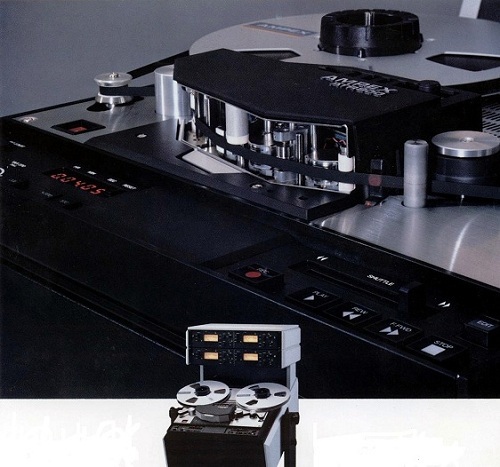 Space is provided for an additional fourth head for playback of two different tape formats without a head assembly change. Ceramic tape guides are used to ensure precision alignment of the tape deck over years of usage. A scrape flutter idler is standard with all head assemblies. SERVICING MADE EASY: Plug-in Printed Wiring Assemblies (PWAs) are easily accessed from the front when the recorder is rack mounted or in a console. The high quality PWAs are glass-laminated for durability and reliable service. Calibration controls for the system's electronics are conveniently placed at the edge of the PWAs, permitting normal machine alignment adjustments without the use of extender cards. Foundational text and photos courtesy of the AMPEX ATR-800 literature. 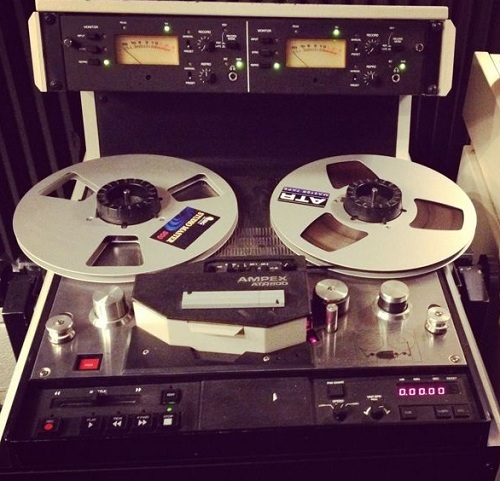 Do you have content, to add, about the Ampex ATR-800 Tape Machine or associated topics? Please feel free to Share it, here! 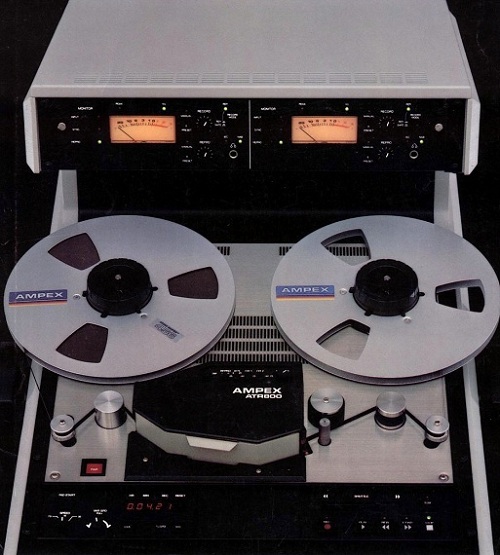 wow, I have never seen this machine and was expecting the 'Ampex' deck that was made by Teac - I believe it was the ATR-700. This is the remote control for the ATR-800.